During ancient times, various land divisions were used to divide and identify areas of control. Islands were divided into moku (districts;) moku were divided into ahupuaʻa. A common feature in each ahupuaʻa was water, typically in the form of a stream or spring. In more modern times, at the height of the sandalwood boom, Kamehameha was buying foreign ships, including six vessels between 1816 and 1818, to transport his own wood to the Orient. (Kuykendall) According to Kamakau, Wahiawā was a prime source for the valuable wood; the largest trees were from Wahiawā. Over the remainder of the decade, the population fluctuated. Things changed at the end of the decade. Following the overthrow of the Hawaiian monarchy, western military and agricultural interests would transform the Wahiawā landscape. Then, in 1897, Californian, Byron Clark, became the Hawaiian Republic’s commissioner of agriculture. In looking for land for him to settle on, he learned of the availability of land at Wahiawā. Clark organized a group of other Californians (as well as others) to join him in settling the whole tract of thirteen hundred acres — which became known as the Wahiawā Colony Tract. Having formed an agricultural cooperative called the Hawaiian Fruit and Plant Company, the homesteaders began formalizing and refining the physical organization of their Wahiawā settlement. Initially each settler lived in a house on his five-acre parcel in the town site and farmed his other land in the surrounding area. It was soon discovered, however, that each settler preferred to reside on his own farmstead, holding his town lot in reserve. The homesteaders abandoned the village plan and agreed that one man, Thomas Holloway, would live on their 145-acre central lot site. On August 27, 1902 a trust deed, referred to as the Holloway Trust, formally set aside the central town lots for the use and benefit of the Settlement Association of Wahiawā resident landowners. Within a few years, Wahiawā Town was underway. Another notable change at this time was the result of a presidential order of July 20, 1899 setting aside Waianae Uka lands as the military reservation. Ten years later, in 1909, these lands would become the site of Schofield Barracks, named after Lt. General John M. Schofield. Dole founded Hawaiian Pineapple Company in 1901. Within a few years pineapple production at Wahiawā had increased that Dole planned a cannery at Iwilei, near the shipping facilities of Honolulu Harbor. In order to transport the pineapple from Wahiawā to Honolulu, Dole persuaded the Oʻahu Railway & Land Company to extend its rail line to Wahiawā. The line to Wahiawā was constructed in 1906. Another change occurred on January 23, 1906 when the Wailua Agricultural Company, later known as Waialua Sugar Company, constructed the Wahiawā Dam and Reservoir, a 2.5-billion-gallon capacity reservoir (the largest in Hawaiʻi;) it is generally known as Lake Wilson, today. The start of World War II further helped to accelerate developments within Wahiawā to accommodate the needs of the growing military population. Wahiawā Elementary School, which started in 1899 to educate children of farmers who were brought in from California, closed their doors in the 1940s to become the new Wahiawā General Hospital. At the end of World War II, the facility continued to remain in operation under the leaders of the Wahiawā Hospital Association. The 72-bed acute care facility was dedicated in 1958, under the official name, Wahiawā General Hospital. 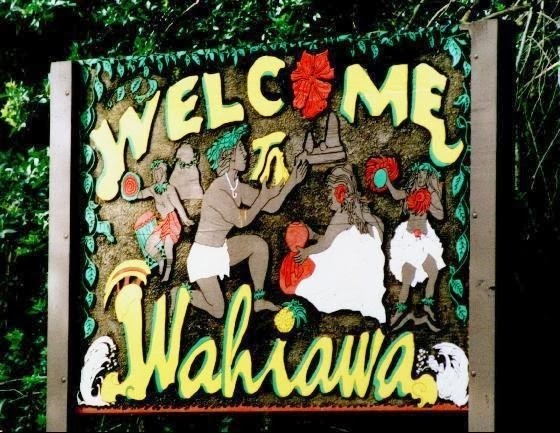 The image shows welcome sign to Wahiawā. In addition, I have included other related images in a folder of like name in the Photos section on my Facebook and Google+ pages. Mahalo Peter for sharing a piece of history of my hometown. I’ve always wondered growing up how Wahiawa became a town it self, again mahalo!